All These Dog Models Are AdoptableVery good. We Truly Needed This Puppy-Filled Week in Late NightMore Quality Dog Content, please. 5 Dogs Test the New Pet Shampoo From Kim Kardashian West’s HairstylistWith pictures. Customer Gets Stolen Puppy Back From Amazon Driver After Emailing Jeff BezosBezos said the driver in question will no longer be working with the company. Dogs Review Isle of DogsDo these dogs have a bone to pick with Wes Anderson’s latest film? The Isle of Dogs Cast Strikes a Pose With Rescue PupsThe cast posed with puppies you can actually adopt! Puppy Graciously Shares Runway With Gigi HadidTod’s put dogs on the runway for its Milan show. 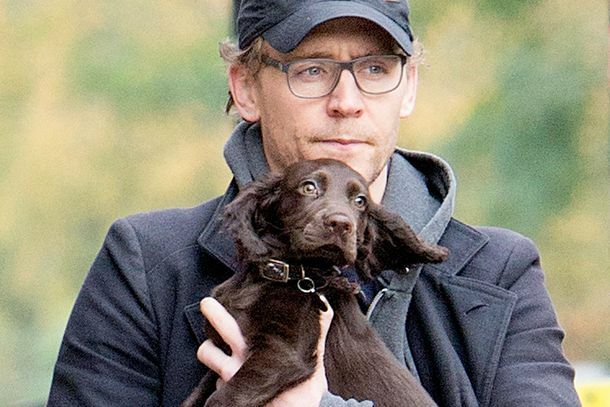 Here’s Tom Hiddleston Holding a Puppy Before Taylor Swift’s Album ReleaseHe’s doing fiiiine. Nina Agdal Upgrades From Leonardo DiCaprio to an Incredibly Cute PuppyIt’s a good puppy. Here’s Good News for People Who Can’t Choose Between Puppies and BabiesA study pertinent to fans of puppies and babies. The World Is Now Home to the First-Ever Set of Adorable Twin PuppiesA first for canine kind. Ryan Lochte Would Like You to Have a PuppyHere you go. Ted Cruz Says He Is Not ‘a Servile Puppy Dog’“I am not in the habit of supporting people who attack my wife and attack my father,” Cruz told the Texas GOP delegation Thursday morning. 8 Actually Good Things That Happened This WeekIt’s been a rough one. Ariana Grande Is a Tonight Show PrincessHer dog, Toulouse, was a Coach model. Adorable Puppy Doesn’t Understand PornIgnorance is bliss. Dogs Getting Ready for CoachellaCanine flower crowns on fleek. Our Favorite Holiday Accessories (Plus a Dog)Chanel, Louis Vuitton, and Grumbles. Break From Awfulness: Russia Gives France PuppyToday’s international news was surprisingly adorable. Tinder Is the New Dog Park for Single GuysStudies confirm that dogs are right-swipe bait. 8 Actually Good Things That Happened This WeekSneezing puppies and better parental-leave policies. Unrealistic Beauty Standards Making Dogs FatFat-shaming your dog is the new fat-shaming your kid. Rihanna Went to the Club, Came Home With a New PuppyYou can find Rihanna in the club, adoptin’ a pup. Behold the World’s New ‘Ugliest’ DogHe looks like the Tasmanian Devil. Is There an Amtrak Cat Café Car in Your Future?These legislators really want to bring their pets on the Acela Express. New York Will Also Get Its First Dog CaféIts owners just need to raise $70,000. Sorry, But Pope Francis Did Not Exactly Say That All Dogs Go to HeavenOr any pets, necessarily. Dog Rescued by Cops After Getting His Head Stuck Inside a Cat HouseHappens to the best of us. Adorable Panhandling Pit Bull Is the New Squeegee ManEven the Post doesn’t mind. That Adorable Boston K-9 Puppy Is Really Growing Into His Police VestSoon he’ll officially be ready to fight some crime. Here Is a Dog Dressed As Ira GlassWhat do you think he thinks of Shakespeare? Here Are the Best Costumes From This Year’s Halloween Dog Parade You want to see these. Injured White House Dogs Cleared for DutyThe heroes America deserves. Malaysian Dog-Petting Event Under FireThe man’s-best-friend stuff is not universal. Breaking: ‘Tiny Loaf’ of a Puppy Found in Drug Dealer’s PocketShe was rescued and named Pocket, naturally. Nice Doggy Probably Didn’t Mean to Set the House on Fire Same goes for the laptop. Perfect Dog-Poop Signs on the Upper East SideAnother way to celebrate National Dog Day. Adopt These Dogs Right Now or You’re a MonsterPlease click. Pictures of cute dogs inside. Dogs Can Get Jealous, Suggests Adorable StudyIt’s ruff being a canine.